Order now to receive special pricing on quantities. ALSO AVAILABLE IN 16" x 20"
the unit pricing shown at the left. the unit pricing shown at the right. 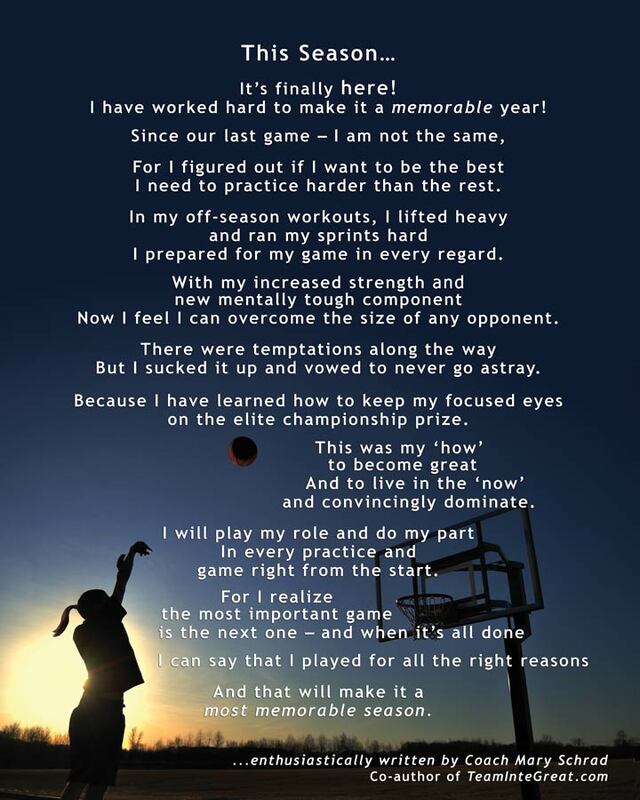 in any off-season play or in any hard fought game. Because in Life’s big picture, it will help them pass the test. to break the press and lead the charge in every player’s name. and goes to the last towel picked up after a full day of sport delights. That is my philosophy right from the start. We understood how team synergy extended our winning streak. But the chemistry blended that allowed us to grow. 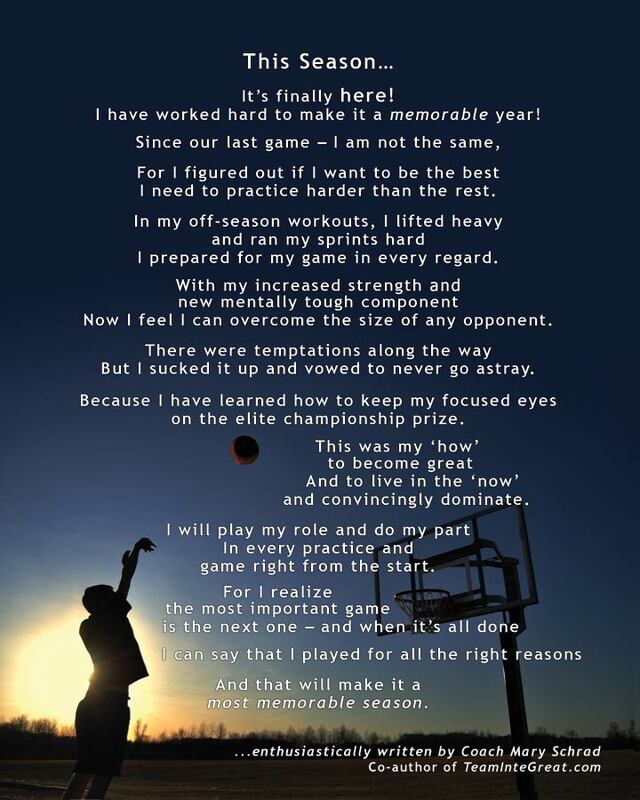 that I reflect uponin my off-season days. I proudly smile, for I know what my career has been all about. 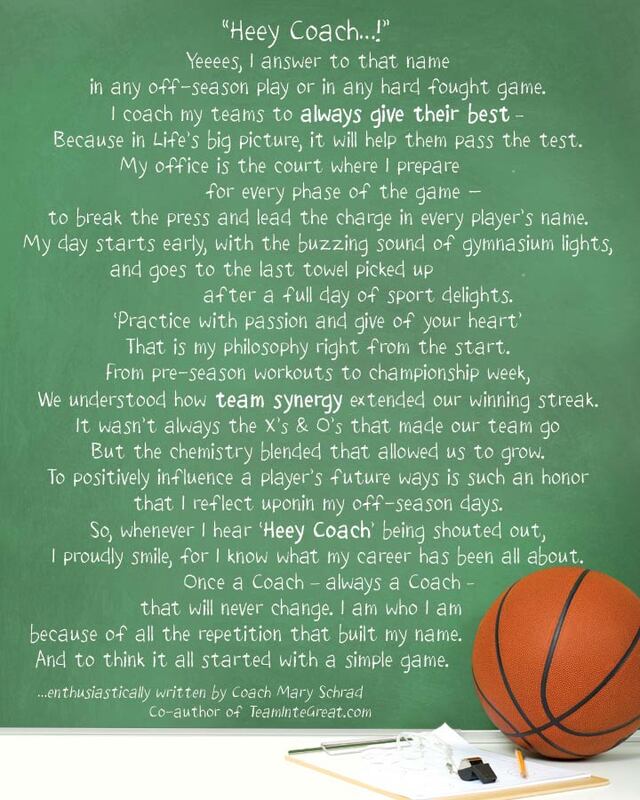 Once a Coach – always a Coach - that will never change. I am who I am because of all the repetition that built my name. And to think it all started with a simple game. 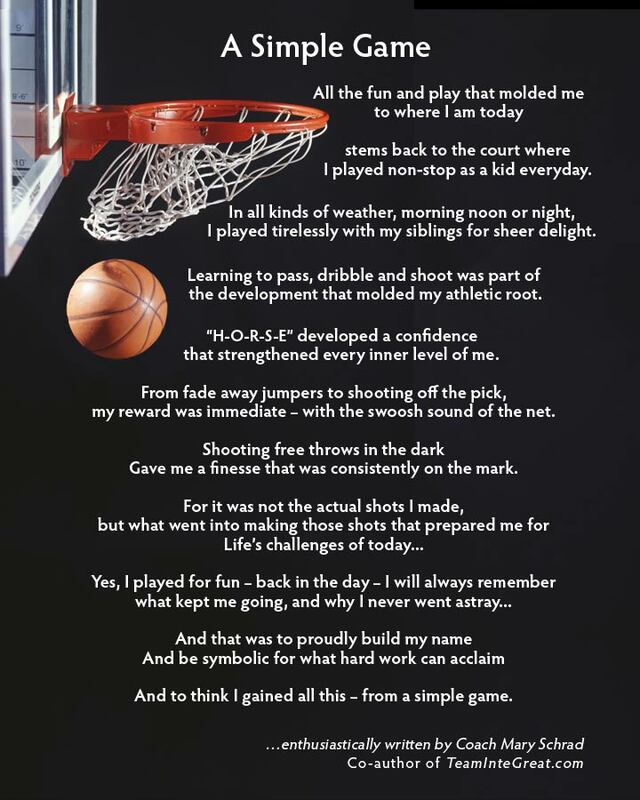 stems back to the court where I played non-stop as a kid everyday. I played tirelessly with my siblings for sheer delight. the development that molded my athletic root. that strengthened every inner level of me. 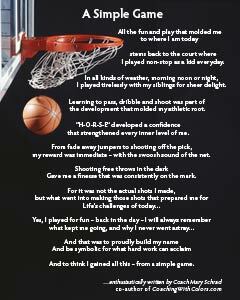 my reward was immediate – with the swoosh sound of the net. Gave me a finesse that was consistently on the mark. And to think I gained all this – from a simple game. that makes a season matter so much? ...that brings teams together to accomplish goals and such? Why are there so many challenges to every season? 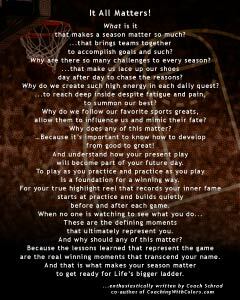 ...that make us lace up our shoes day after day to chase the reasons? Why do we create such high energy in each daily quest? ...to reach deep inside despite fatigue and pain, to summon our best? allow them to influence us and mimic their fate? …Because it’s important to know how to develop from good to great! will become part of your future day. is a foundation for a winning way. 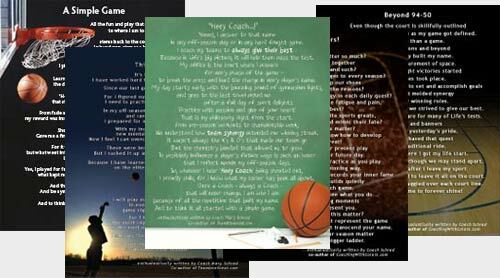 starts at practice and builds quietly before and after each game. 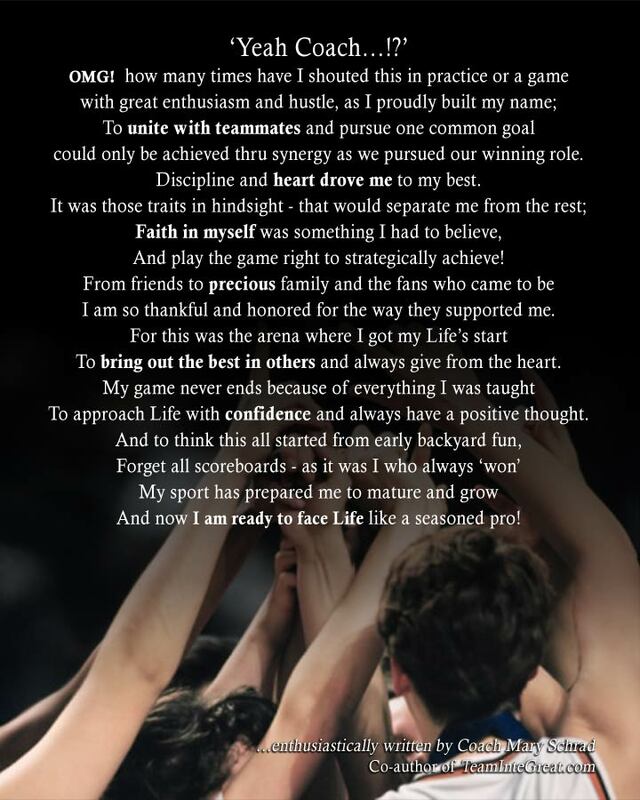 These are the defining moments that ultimately represent you. And why should any of this matter? 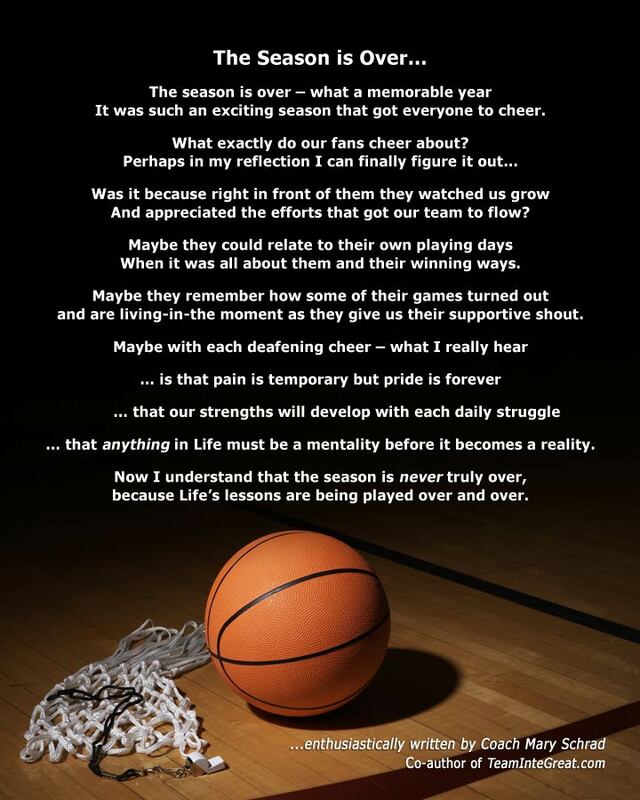 are the real winning moments that transcend your name. to get ready for Life’s bigger ladder. I have worked hard to make it a memorable year! I need to practice harder than the rest. I prepared for my game in every regard. Now I feel I can overcome the size of any opponent. But I sucked it up and vowed to never go astray. on the elite championship prize. And to live in the 'now' and convincingly dominate. 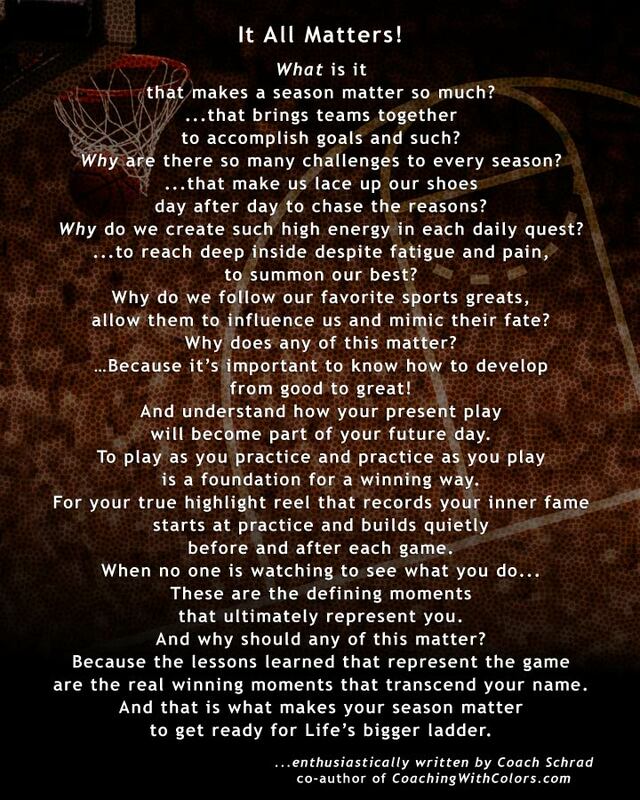 In every practice and game right from the start. And that will make it a most memorable season. every area challenged me as my game got defined. 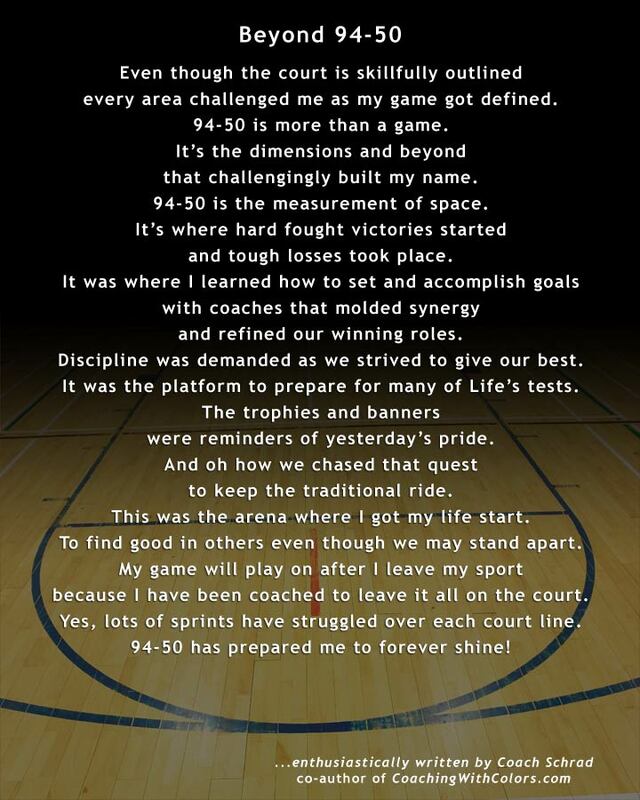 94-50 is more than a game. It’s the dimensions and beyond that challengingly built my name. 94-50 is the measurement of space. It’s where hard fought victories started and tough losses took place. 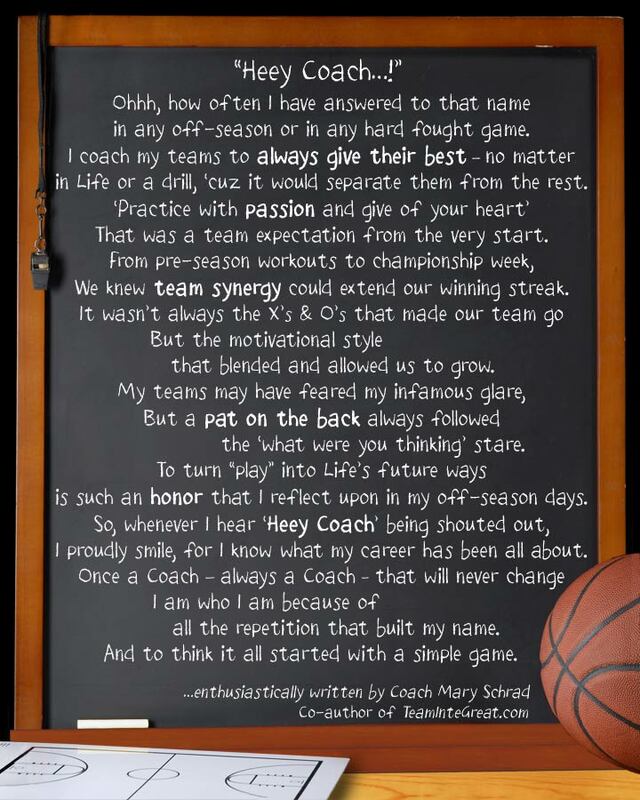 with coaches that molded synergy and refined our winning roles. Discipline was demanded as we strived to give our best. It was the platform to prepare for many of Life’s tests. The trophies and banners were reminders of yesterday’s pride. And oh how we chased that quest to keep the traditional ride. This was the arena where I got my life start. To find good in others even though we may stand apart. 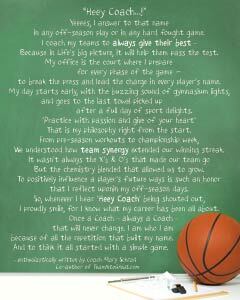 because I have been coached to leave it all on the court. 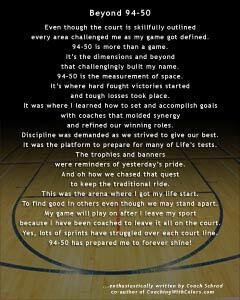 Yes, lots of sprints have struggled over each court line. 94-50 has prepared me to forever shine!